And so went the conversation with my husband a few days ago. You see, we are putting our home on the market, and he would love for me to “de-clutter” my cookbook collection. The problem is, I don’t think of my cookbooks as clutter! They have a very important place in my home and my heart. And when I did start combing through some of my older books, I was struck by how many wonderful recipes were there, just waiting like old friends, hoping to be invited over for dinner again. Those books were chock full of sweet memories of parties and events; the whole process filled me with nostalgia and made me realize that my cookbooks weren’t going anywhere, except to my new home to create more new memories! Bring on the boxes! So, by now you may have guessed that today’s recipe comes from one of those older cookbooks that I could not bring myself to weed out. I re-discovered it in, “The Girls Who Dish! Seconds Anyone?” by Karen Barnaby, Margaret Chisholm, Glenys Morgan. I have made this recipe many times over the years for various festivities and it has always been inhaled in seconds! 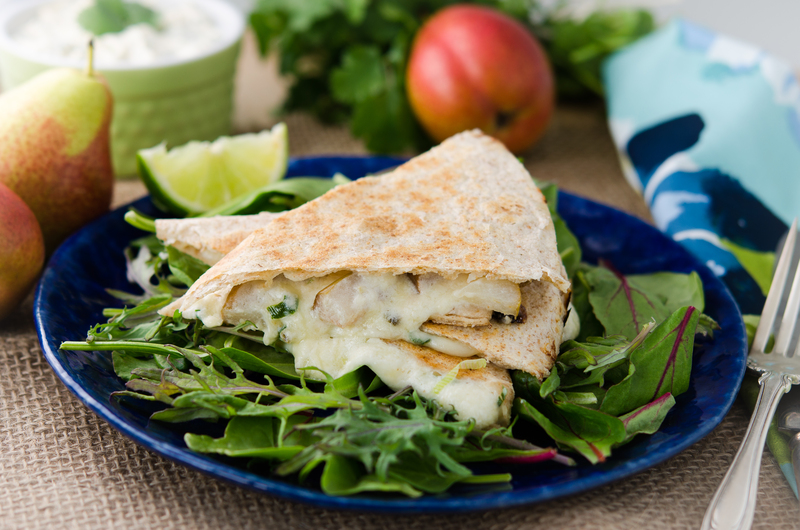 Creamy goat cheese and Monterrey Jack are brightened by juicy, sweet, grilled pears. Garnished with (or smothered in) Cilantro Cream, this recipe elevates the humble quesadilla to lofty heights. I really wanted to make some pickled red onions as a second garnish, but ran out of time. I bet the combination would be mind-blowing. I am bringing a massive platter of my quesadillas over to Angie’s Fiesta Friday! If you want to sample them and many more delicacies, come join us over at Angie’s amazing site – “The Novice Gardener“. Friday’s will never be the same, I promise! Add a fresh tossed salad for a perfect meal! Cut the pears in half and remove the core with a melon baller. Cut into 1/3 inch thick slices. Toss with olive oil and a little salt and pepper. Grill or sauté for 1 minute on each side. Chop the pears into ½ inch pieces. Combine the pear, cheeses and green onion in a bowl and mix well. Divide the mixture into 6 portions and spread 1 portion onto half of each tortilla. Fold the tortilla in half. Heat a non-stick pan over medium heat. Cook each tortilla for 1 – 2 minutes per side, or until the cheese melts and the tortilla turns golden. Cut each tortilla into 4 pieces and serve with Cilantro Crema or your favourite fruit salsa. Whisk all of the ingredients together in a small bowl. Chill until ready to serve. So happy I found this recipe again! running out of things to entertain with. These sound wonderful. I too still refer to an old Fanny Farmer! I don’t think it is reasonable to get rid of cookbooks, Chef Juliana. 😀 Yes? The quesadillas look so good. Are you also looking for recipes from Google? This looks like such a wonderful combination! 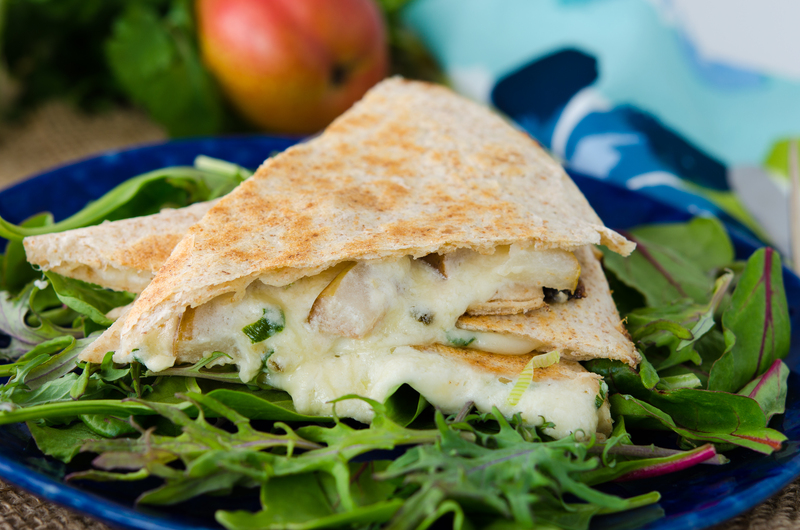 I have never tried quesadillas with pears. I am going to try this! – No, no, no. I made the mistake of downsizing my cookbooks . Two years ago, a few of us posted about our cookbooks (http://fae-magazine.com/2013/04/19/favorite-cookbooks/). I am so glad that you chose to keep them ALL. Cookbooks are like shoes to me; you can never have too many 🙂 These sound and look absolutely delicious! I love this dish Julianna! I love the combination of flavours 🙂 Definitely can’t wait to try this as I LOOOVE pear and chevre! I have had this conversation with my husband too! We live in a very small apartment and I’ve stored all my cookbooks and baking gear in the small extra room! He cannot believe how I’ve accumulated so much and doesn’t even want to step into that room (because it’s so “cluttered” – which isn’t for me! 😀 Good luck with moving!! And can anyone really ever have too many cookbooks?? I know I couldn’t pick and choose any to offload if I had to! Thanks so much, Geraldine! I appreciate that! A wonderful recipe, Julianna 🙂 It looks absolutely tasty. I don’t think I could get rid of any cookbooks either, though there are a few that are currently in my parents attic as I didn’t quite have room to move them one place I lived and they have never quite escaped. These quesadillas sound unusual but I can see it working. They look great! 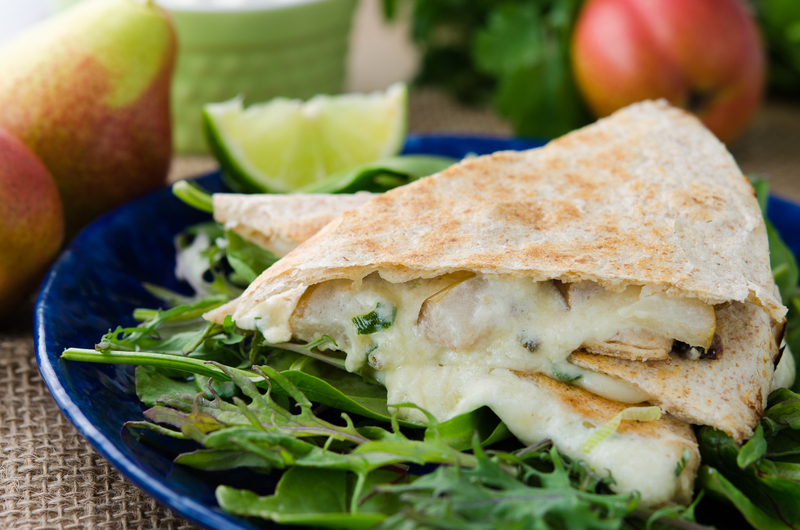 there’s no such thing as too many cookbooks, and without them you wouldn’t have this yummy looking quesadillas recipe! I hope your husband saw the error in his thinking after he tasted this quesadillas! It sounds amazingly delicious to me! I’m so glad you did too Juliana! Love the grilling of the pears first. Yum! You should prove your point by making irresistible recipes from all your cookbooks for your husband! Thanks for your vote, Sadia! I completely understand being attached to your cookbooks, I love mine! When we moved last year I did get rid of the ones I hadn’t opened for the past 5 years but it was painful. Yes, I love donating tons of stuff to my school too! I have done that a lot in the past. I LOVE my new and old recipe books – and now I am adding to my collection with some oldies from my mom and grandma! My pear tree (hopefully) will bear fruit this year. What better way to celebrate than with your delicious recipe! YUM!! I love the idea of collecting the recipes from mom’s and grandmas. Unfortunately, we seem to have mis-located my grandma’s recipes and my mom has mountains of recipes, just like me! Nooo..Please don’t chuck out the books. They are supposed to be priceless. But if ever you decide to do that, please I am taking all of them. Yummy! My sister and I chaperoned a cabin full of young college ladies this weekend. Many of the ladies were vegetarian, so our menus reflected this. I made these Friday night as an appetizer for them and we all loved them. The only change I made was that I did not use the green onions-only because I forgot them. These will be a regular now. Thank you! Great idea to grill the pears first to soften them. Anything with melty cheese gets my top vote. Looks delicous. This is the fanciest quesadilla I’ve seen, Julianna! The flavors sound divine. Oh my, asking a cook to get rid of their cookbooks is like asking her to go to work with no pants.